NEW YORK — Avid, Amazon Web Services (AWS) Elemental and Caringo were among the many members of the Media & Entertainment Services Alliance (MESA) that are showcasing their latest products, services and strategies at NAB Show New York Oct. 17-18 at Jacob Javits Convention Center. 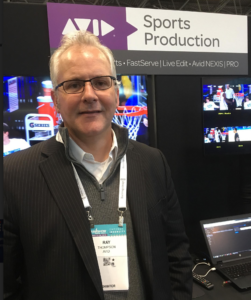 Avid is again touting the web-based version of its MediaCentral media production and management platform at NAB Show New York. “Coming off of IBC, our biggest thing was, first and foremost, showing MediaCentral running in the booth, connected to pretty much the entire infrastructure and focusing on letting people know it’s time to upgrade and it’s time to start thinking about upgrading your environment, so from legacy interplay to the latest and greatest” capabilities, Raymond Thompson, Avid director of market solutions for broadcast and media, told MESA at NAB Show New York Oct. 17. The browser-based solution “basically allows smaller production groups” to, among other things, “easily create bins, share media, add metadata and basically connect folks from pretty much any location,” he said, adding: “These disparate groups can now log in using their regular browser and create their own projects, bins and media and metadata, and then they can see that in real-time, regardless of whether you’re sitting in a full-blown system or just looking at stuff in a browser.” This solution is “ideal for things like review and approval-type workflows where somebody can be making comments … for color correction, lighting, whatever — and all that can be seen and ripples throughout the entire connected universe,” whether users are working on-premise or remotely connected, he said. Editorial Management is a simple-to-deploy asset management tool that “accelerates collaboration among post production and broadcast teams through secure, reliable and easily configured media workflows,” according to Avid. It was announced by the company a year ago, demonstrated at NAB in Las Vegas earlier this year and shipped this past summer, Thompson said. Avid is also again touting its next-generation Maestro Engine real-time graphics and video hardware rendering platform for its Maestro Graphics product line. The next-gen Maestro Engine was recently unveiled by Avid at the IBC Show. Maestro Engine scales from HD and 1080p to Ultra High-Definition (UHD), supporting both Serial Digital Interface (SDI) and Video over Internet Protocol (VoIP), Avid said. With Maestro Engine, broadcasters can produce augmented reality, graphics, virtual studios and video wall content in the industry’s highest achievable quality, according to the company. As the successor to Avid HDVG, Maestro Engine enables broadcasters to introduce new production capabilities — including 3G, UHD, HDR and IP workflows — alongside their current HD/SD SDI workflows, with “minimal disruption,” the company said. Available in two configurations — Maestro Engine and Maestro Engine 4K — the platform works with all Maestro graphics suite solutions, and provides performance, scalability and format support to meet and even surpass customers’ current and future broadcast requirements, according to Avid. AWS Elemental is highlighting advanced approaches for media ingest, video processing and delivery, content monetization and machine learning-enhanced video utilizing AWS Media Services. 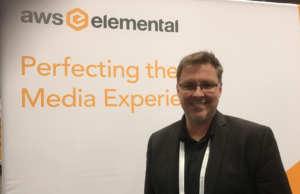 Pointing out that his company has been exhibiting at the New York event for a few years, Keith Wymbs, AWS Elemental chief marketing officer, told MESA Oct. 17 “we’ve had good traffic” at the company’s booth on the first day. AWS Elemental is “trying to enable that level of nimbleness that’s required to satisfy the consumers today,” he said. 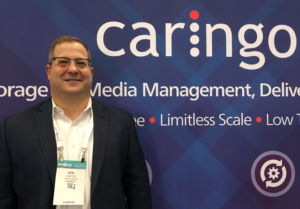 Caringo comes to NAB Show New York with an updated product suite that was “finely tuned for on-demand, distributed, content-driven use cases,” Adrian Herrera, VP of marketing, said ahead of the event. The offerings being touted by the company this week include a new single server, S3-accessible storage appliance specifically designed for use by post-production houses, studios, broadcasters and small enterprises. With that appliance, “small-to-medium-sized content-driven organizations can keep assets within their firewall while still enabling S3 access and delivery,” Herrera told MESA. Caringo also enhanced its platform for large-scale deployments so that organizations including broadcast service providers, studios and large post-houses can move content faster, internally and externally, via S3 and NFS to Swarm object storage, he said. “Our main message – our main approach – it’s really on-prem S3 storage: get the benefits of the cloud, but in a model that is in your own data center, on your own floor, with more cost advantages because it’s not a subscription,” Benjamin Canter, Caringo VP of sales, told MESA at the show Oct. 17. Caringo also recently announced the Swarm 10 Single Server appliance, and that is also being showcased by the company this week. “We’ve now shrunk the whole stack” down to a “single-server platform, which is about 75 percent less hardware than any of our competitors,” Canter said. Swarm Single Server “provides all the features of Swarm with 96 TBs of raw storage that can be racked or fit under a desk,” Caringo said while announcing Swarm 10 in October. 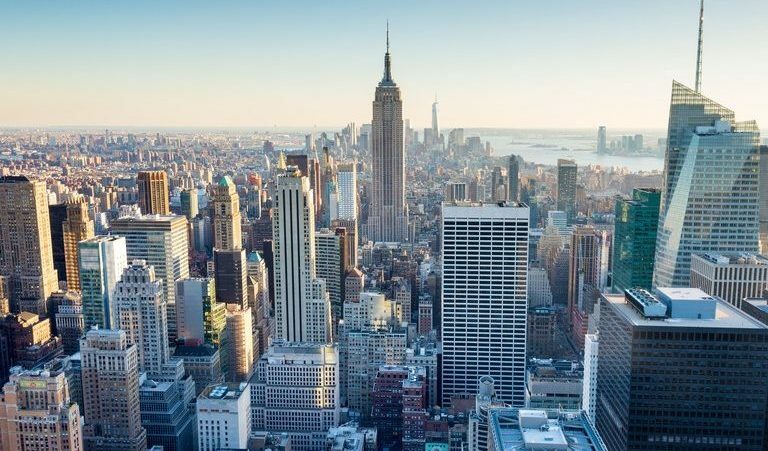 “The compelling story is: get the benefits of the cloud, small footprint, easy to start, easy to manage, with high security, especially for those customers who don’t want to put things up in the cloud,” Canter said at the show.